In the fight against cyber-crime, choosing the right fraud prevention tool is essential. Whether your business is actively seeking a fraud and risk management solution, or you’re investigating the other options currently available, these tips have been designed to make finding the best supplier easy, efficient and effective. Rules should be available to setup in real-time and offer complete flexibility. Testing different combinations of rules proves vital for analysing and managing specific areas of risk. 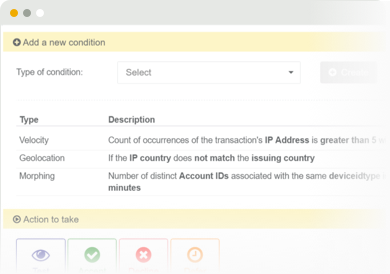 The right system will enable you to test rules in advance and auto-create lists of known bad trends, which can then be acted upon by your system in the future - saving you time and money across millions of transactions. Review your current provider’s offering, and ask how many rules can be setup in your system – on average, this will be between 8 and 20. What is the right amount for your business? As every business is different, choose a supplier who can provide you with the ability to create your own custom rules, enabling you to track behaviours specific to your needs. 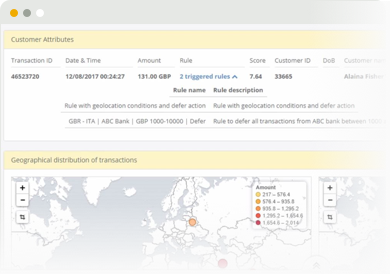 Select fraud protection software that will enable you to create, reconfigure and apply rules in real-time, within an intuitive and easy to use interface. Data analysts need access to multiple internal and external data sets to accurately evaluate cases, as well as a solution for linking this information contextually. The best tools provide significant insights via interactive dashboards which can be used to connect multiple hidden data points, resulting in faster and more targeted decision-making. 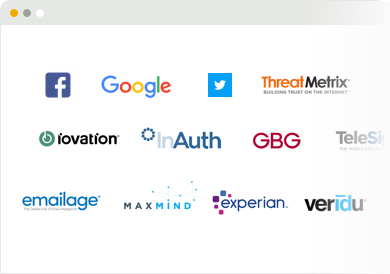 Choose a fraud detection provider who utilises the latest cutting-edge technology to allow for extensible searching, and unique qualitative and quantitative results. 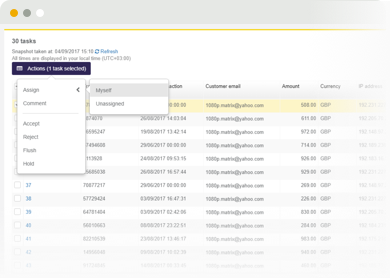 Find the right solution to enable your fraud and analyst teams to save time when pulling together fraud cases by using easy to read data stats, as well as intuitive reporting systems. Pick a solution that uses the newest analytics and search engine to connect uncommon data, and uncover previously hidden behavioural patterns. Investigation is often a challenge for businesses due to the wide and varied needs of different teams. You should therefore select fraud detection software that has a straightforward and easy-to-understand interface designed to unify your teams on a global scale, and distributes tasks to your designated specialists. This will enable the business as a whole to make quicker and more informed decisions. Find a supplier who can provide you with aggregated data for easier decision-making. Ensure your selected supplier has tried and tested results. From authentication checks to configurable acceptance rules, real-time behavioural analytics, workflow management, and automation, the right fraud protection software can do more than simply protect against fraudulent transactions – it can streamline decision-making and increase overall revenue. Don’t compromise between data sources and vendors – instead, choose a supplier with the exact combination of sources to meet your needs, and streamline customer acceptance. Select software that can cut manual case review times down, saving you and your teams’ valuable working time. When you’re considering changing any service or system, there are always some steps that you need to consider before making the switch. But don’t be afraid to look to around. Most suppliers have now designed their systems to integrate with your existing in-house systems, thus making the switch a breeze. Make sure you consider the total cost of changing suppliers, including your research time, meetings, expenses, licences, development – it all adds up.. Many suppliers will offer a free consultation to ensure their system fits your business requirements and integrates with your current systems – check these ones out first. Still looking for a solution which can help you combat fraud, manage risk and meet your compliance needs, regardless of territory or sector? Optimize by Pay360 can provide you with all of the above, as well as many other additional benefits.